A pair (Not Matching see images) of Armoured Officer's collars clutch back fittings. 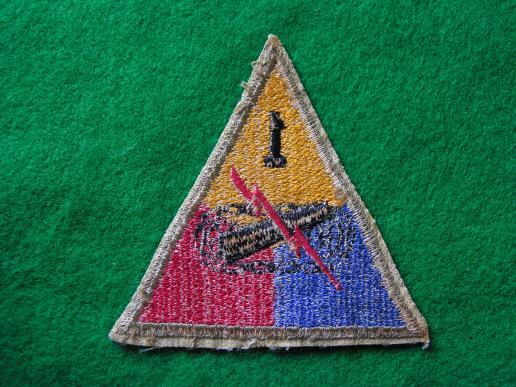 An early III Armored Division patch in mint un-issued condition. Fully embroidered in cotton thread. The 3d AD arrived in the European Theatre on 15 September 1943, conducting pre-invasion training in the Liverpool and Bristol areas. It remained in Somerset, England until 24 June 1944, when it departed to partake in the Normandy operations. 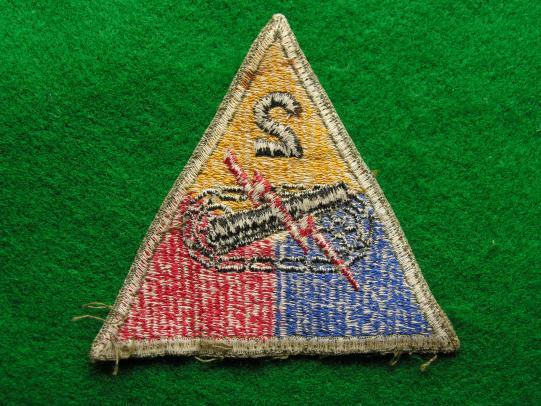 A 2nd Armoured patch in good condition, used and removed from uniform. 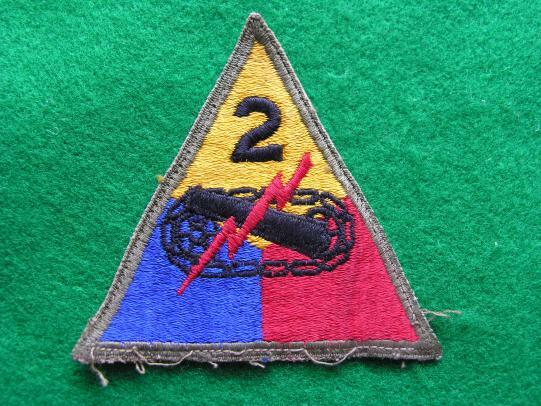 Patton's 2nd Armored Division ("Hell on Wheels") was an armored division of the United States Army. The division played an important role during World War II in the invasions of North Africa and Sicily and the liberation of France, Belgium, and the Netherlands and the invasion of Germany. 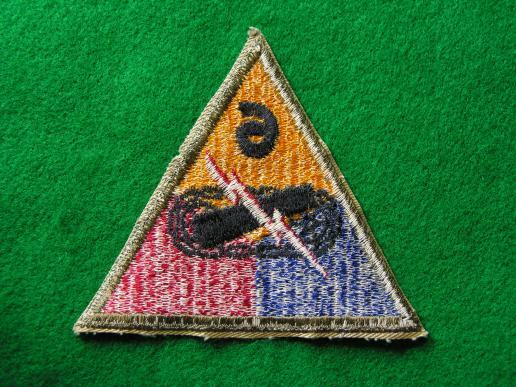 A good scarce fully embroidered Tanker patch in near mint condition. Good near mint condition Armored Force patch. 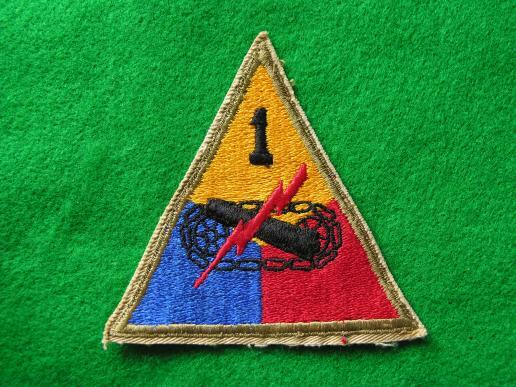 A good example of the 1st Armored patch, I have several in stock all good pieces. Nick name The Old Iron Sides. The 1st Armored arrived in Northern Ireland on 16 May 1942, and trained on the moors until they moved on to England on 29 October 1942. The unit's first contact with an enemy was as part of the Allied invasion of Northwest Africa, Operation Torch. They fought in Sicily through Italy and Germany. 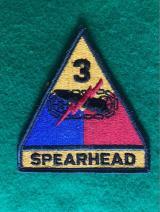 A good 3rd Armored patch, used removed from uniform. The first elements of the 3rd Armored in France saw combat on 29 June, with the division as a whole beginning combat operations on 9 July 1944. 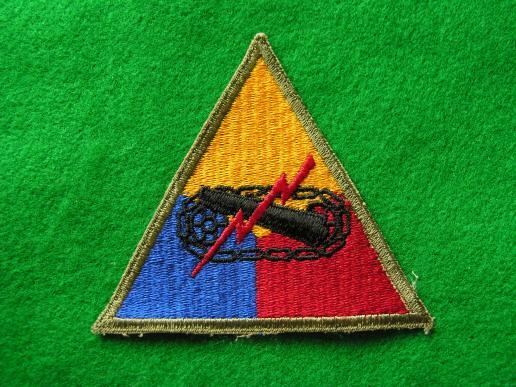 During this time, it was under the command of VII Corps and XVIII Airborne Corps for some time, and assigned to the First Army and the 12th Army Group for the duration of its career. They went on to fight across France, Belgium (Battle of the Bulge) Holland and Germany. 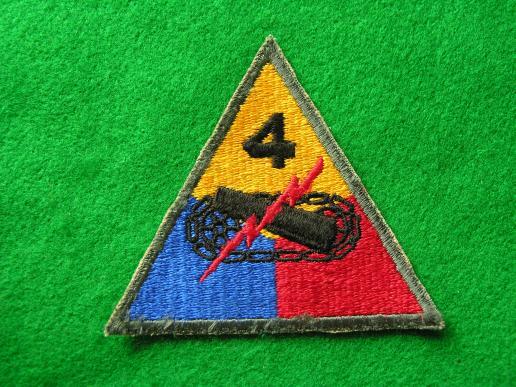 A good 4th Armored patch in used issued condition. Have three in stock they all differ slightly. The 4th Armored Division of the United States Army was an Armored Division that earned distinction while spearheading for General Patton's Third Army in the European theater of World War II. 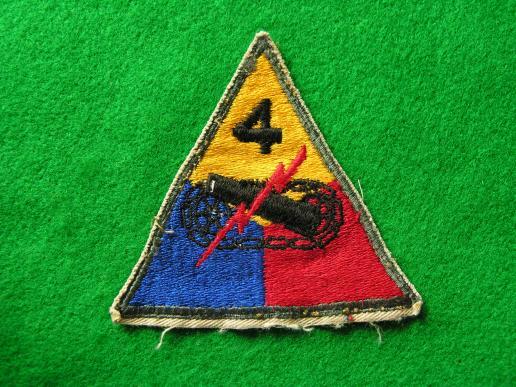 Two days after the Germans launched their Ardennes Offensive, the 4th AD entered the fight (18 December 1944), racing northwest into Belgium, covering 150 miles in 19 hours. The 4th AD, spearheading for General Patton's Third Army, attacked the Germans at Bastogne and on 26 December, the 4th AD was the first unit (Company C, 37th Armored Battalion) to breakthrough at Bastogne and relieve the besieged 101st Airborne Division. The 4th Armored, unlike most other U.S. armored divisions during World War II, didn't officially adopt a nickname for the division during the war. However, their unofficial nickname "Name Enough" came to be years after the war due to the 4th Armored Division commander who trained them during the war having stated back then, that, "Fourth Armored Division was name enough"; "They shall be known by their deeds alone". 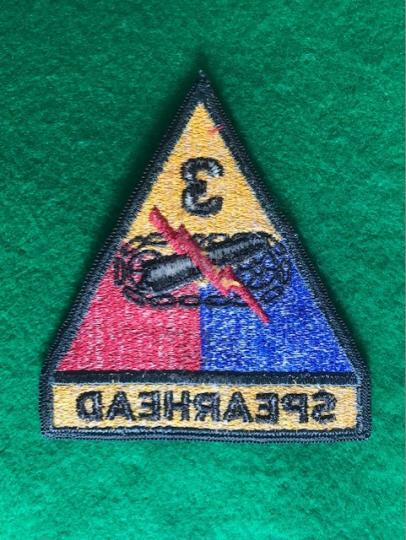 A good 6th Armored patch in near mint condition, have serveral in stock. 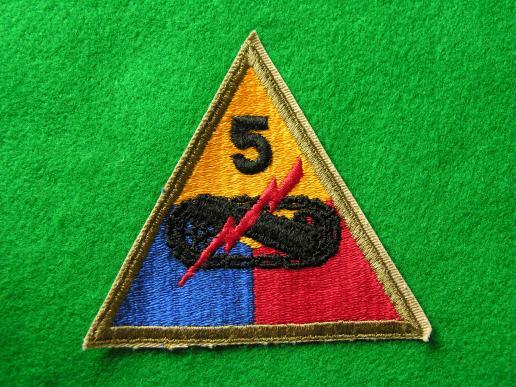 The 5th Armored "Victory" Division was activated on 10 October 1941, and reached the United Kingdom in February 1944. The division landed at Utah Beach on 24 July 1944 and moved into combat on 2 August, driving south through Coutances, Avranches, Vitré, and across the Mayenne River to seize the city of Le Mans, 8 August. Turning north, the division surrounded the Germans in Normandy by advancing, through Le Mêle-sur-Sarthe liberated on 11 August, to the edge of the city of Argentan on 12 August8 days before the Argentan-Falaise Gap was closed. Fought across France and Germany. 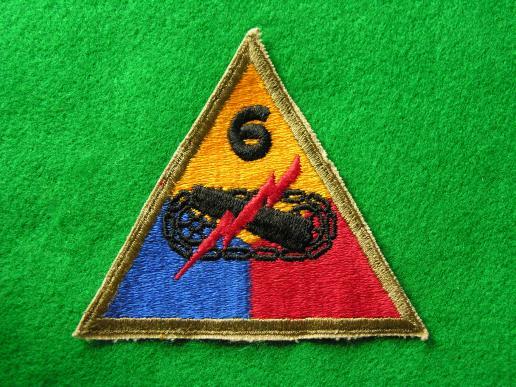 A good example of the 6th Armored patch, un-issued near mint. Have several in stock. Nick name for the 6th was The Super Six. Trivia, In the film Kelly's Heroes, Oddball the tank commander was from the 6th Armored. After continuing its training in England, 6th AD landed on Utah Beach in Normandy on 19 July 1944 as a follow-on unit, and went on the offensive as separate combat commands in the Cotentin Peninsula in support of the Normandy Campaign. From there across France and Germany.